jim mcnamara, joel8080, Captain64-200, exp2000, Swami805, bhale1 and 13 Guests are viewing this topic. I don't know how you do it Alan. If I opened that box to see that, I would just say "Hell No!" I'm not retired, but I don't plan on doing that when I do. This is a reel repair site where you learn to fix reels. Not send them to you. a 113hn penn baja special, spool bearings opened up, cleaned out and lube with TSI 301 for 60 seconds of freespool! Hey, where's the Jackson Browne music? That's some tight work there on the Baja, Boss Man!!! ok, finished all of them. the first is our penn 16s with the frame on straight. it's loaded with 600 yards of 60 pound hollow (because it already had 450 yards) and a 50 yard topshot of 60 pound mono. i was able to get 20 pounds at strike and 25 pounds at full. 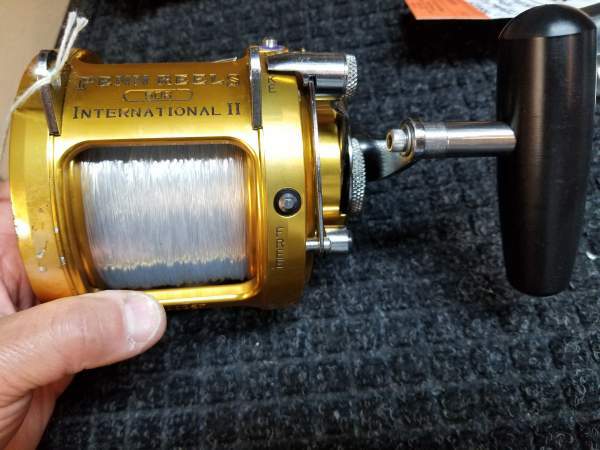 not what i would normally want from a 60 pound line class reel, but it will work well enough. it got a full service and a signature handle. the original handle was starting to corrode. the second is another old school penn international, the 50s. i pulled 500 yards of 130 pound solid braid off of the accurate and packed it onto the 50s, then added 130 yards of 80 pound mono. after a full service and a handle upgrade, i set the drag to 25 pounds at strike and was pleased to find 40 pounds of drag at full. i would normally never fish this reel with such a light topshot. third is a really beautiful accurate 50 wide. i pulled off the original 130 pound solid braid and the spooled on 600 yards of 130 pound hollow, then 100 yards of 200 pound hollow, then a 100 yard topshot of 100 pound mono. setting the drag to 30 pounds of drag at strike gave me a corresponding 45 pounds a full. and lastly, a 75th anniversary 50vs wide. 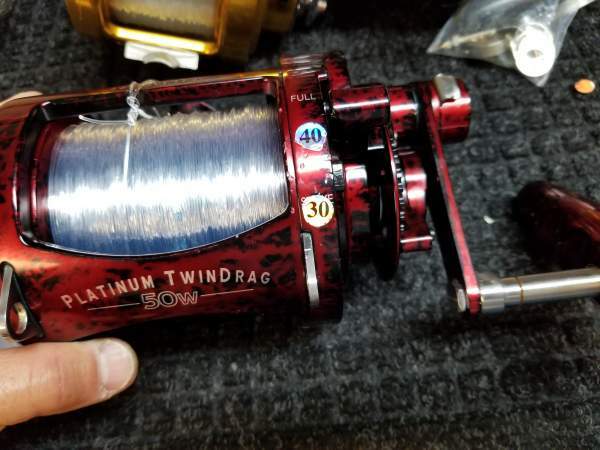 this reel was loaded with 800 yards of 200 pound hollow, then a 25 yard topshot of 130 pound mono. 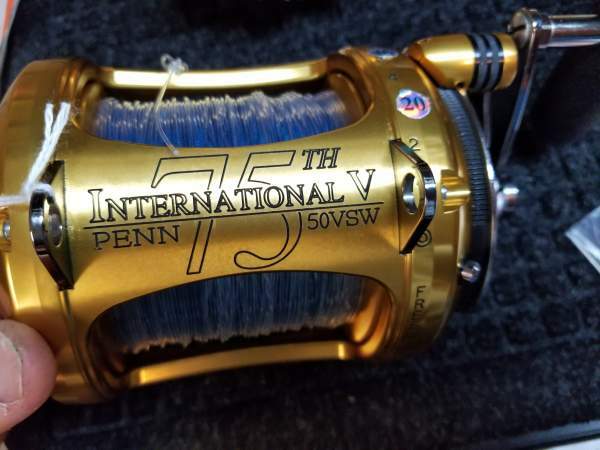 40 pounds of drag at strike gave me a disappointing 50 pounds of drag at full, but that is the way that this particular reel was designed. it was never intended to deliver the extended drag range of the newer reels. none of these reels have the drag curve that i would look for, but they will definitely catch fish. cindy, your reels are ready. Sal: I have been dyslexic and get things mixed up at times so I say what the heck..........do it again! Since the stroke four (4) years ago I need a great grammar check and Ruth if she is available. Taking a break from reels this afternoon to tie up a hundred shrimp fly rigs. I'm part of a group called Discover Angling. it's a non-profit that takes kids out fishing. We typically go out on the Hulicat with Tom Mattusch and Mike Michael Cabanas. Our trip is scheduled for this Tuesday and the weather looks spectacular! We have 20 rods already set up, all the shrimp flies, weights, bait and lunch. We just need the kids to show up on time! 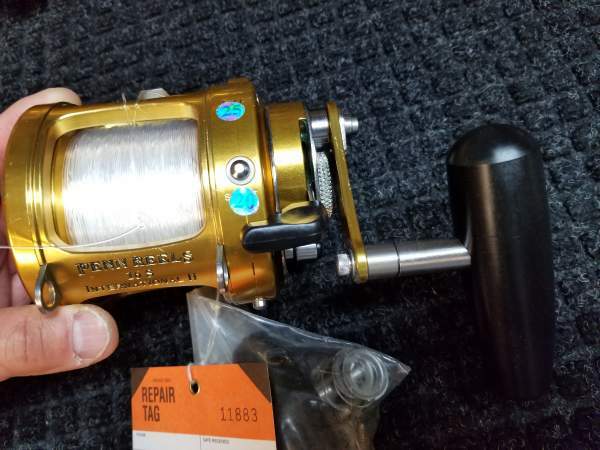 Thanks also to out local Fisherman's Warehouse for the price break on the terminal tackle. Going rockcod fishing on Tuesday!!!!! Hook a fish and hand them the pole,,,,, hope you get a bunch,,,,what your do is really cool !!!!!! 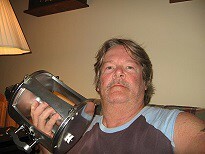 i love working on charter boat reels!!!! They always good 'n' fonky...HA!